Ever wonder where the Navy's Blue Angels jets go when they are not polluting the skies over North America for your "entertainment?" 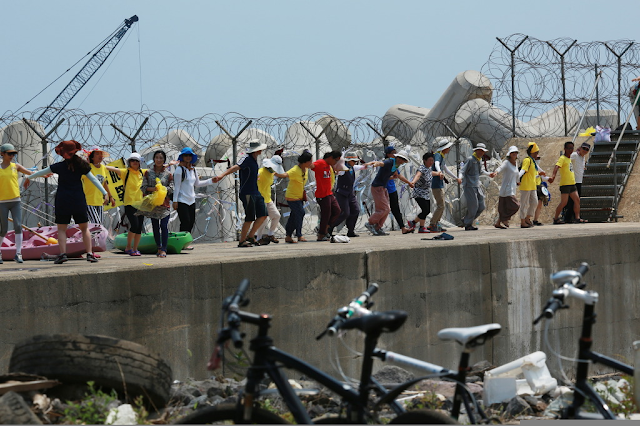 This week they were in South Korea intimidating the villagers of Gangjeong who have kept up a spirited defense of their coral reefs, their fisheries and their way of life from creeping (and creepy) militarism. The South Korean Navy and the Samsung Corporation built a deep water port for destroyer ships the U.S. can use to threaten China. Now that it's nearing completion, here comes the U.S. Navy to bully the resistance fighters with low flyovers and ear splitting sounds effects. Fun eh? "a formation of Navy Blue Angel war planes came screaming over the village. For the next 15 or so minutes they went back and forth directly over Gangjeong doing various stunts. One of the stunts brought the planes very low in an ear splitting maneuver." Low flying jets are hardly the only form of intimidation. Many, many arrests and fines over the years have harassed those who opposed construction of the port. And the village collectively is about to be fined the equivalent of $20 million for obstructing and successfully delaying construction. 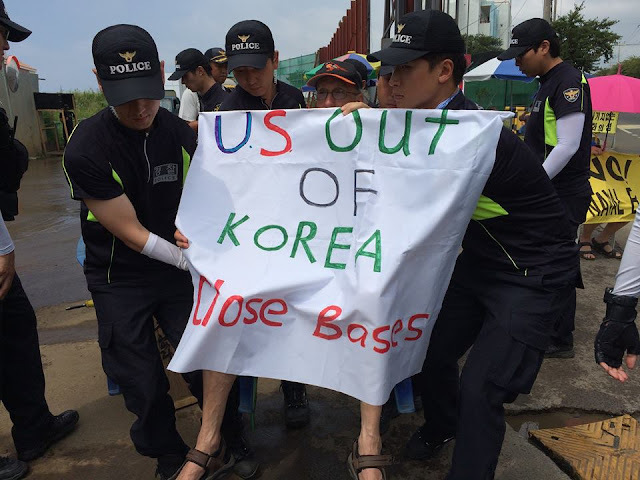 You can call the South Korean Embassy in Washington DC and demand that they leave Gangjeong village on Jeju Island alone: (202) 939-5654. 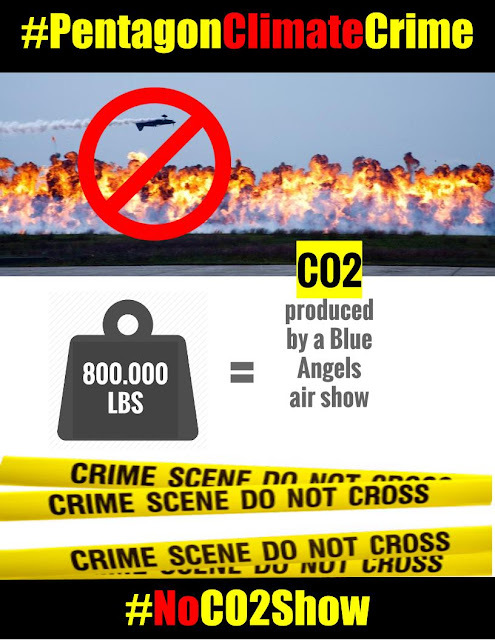 Meanwhile, back in the U.S. the Blue Angels are following a regular schedule of showing off their might two or three times a week to adoring audiences who have been trained to disconnect from what war planes are designed to do i.e. intimidate and kill people, mostly civilians. What are the major differences between the fleet model and the Blue Angel F/A-18? The Blue Angel F/A-18s have the nose cannon removed, a smoke-oil tank installed and a spring installed on the stick which applies pressure for better formation and inverted flying. Otherwise, the aircraft that the squadron flies are the same as those in the fleet. Each Blue Angel aircraft is capable of being returned to combat duty aboard an aircraft carrier within 72 hours. Mainers will have an opportunity to join a protest organized by Veterans for Peace of the Blue Angels in Brunswick over Labor Day weekend. Join in if you think greenhouse gas emissions, noise pollution, bullying and "simulated bombing" are nothing to cheer about.